Where exactly is Germany? What is everyday life like for German families? Which holidays are celebrated? And what is special about the German language? Here, you can find out more about German family life, traditions, and the geography of the country. 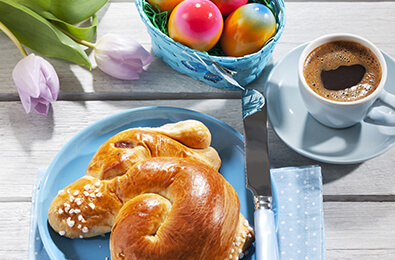 Chocolate bunnies, colourfully painted eggs and sweet pastries – these treats can be found on tables in Germany every spring. At Easter, the country celebrates the resurrection of Christ and the beginning of spring. Easter Sunday in particular is oriented around the family. Here, children can look in the garden for Easter eggs and presents hidden by the Easter Bunny. Then everyone comes together for a traditional breakfast, where they enjoy fresh bread, milk, cheese, and sausage. Also popular is what’s known as the Easter bonfire, where across the country, a metre-high pile of wood is set ablaze to welcome the new season and drive away the winter. The majestic Alps and men in lederhosen (leather trousers) – this is what Germany is known for the world over. But the whole country has a lot more to offer than just Bavaria and the famous Oktoberfest. Did you know that in the north, there are no mountains to be found for miles around? Instead, there are nearly endless green meadows and flat coastal landscapes. On the coasts of the North Sea and the Baltic Sea and their many islands, you can enjoy the fresh breeze whirling around you. Germany itself is located in the middle of Western Europe. From the northern to the southern tip, it’s roughly 876 kilometres, and from east to west it’s around 640 kilometres. Germany also borders nine other countries. And it’s full of variety: almost every region has its own traditional customs and special dress. The fisherman’s shirt is typical in the north, for example. Order, punctuality, diligence and steadiness – these are the virtues that Germany is known for. 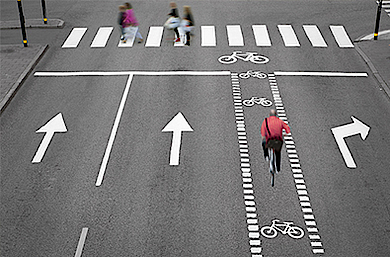 Buses and trains run like clockwork, streets are divided with clear lines for bicycles, cars and pedestrians, and at the office, there’s a different form to go along with each and every procedure. Maybe that sounds boring and conservative, but it makes communal life considerably easier. Furthermore, Germans are social and considerate people, open to the world, and have a good amount of humour. The main language in Germany is High German. But did you know that the German language has around 20 dialects and so many subdialects that it would be impossible to count them all? From the capital Berlin and the flat north to the Alps – a different sound resonates in every region. And that starts with the greeting: in Bavaria, you’ll encounter ‘grüß Gott’ – literally ‘(may) God greet (you)’ – whereas in Oldenburger Land, a simple ‘moin’ (hey) suffices. The languages are so different that Northern and Southern Germans can hardly understand one another when they are speaking in their dialect. 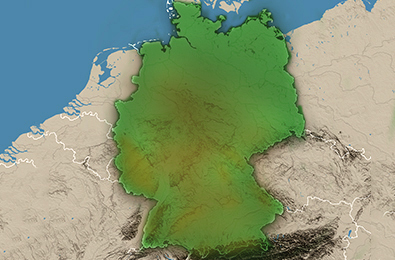 Christianity, Islam and Judaism – various religions also play a part in Germany’s diversity. 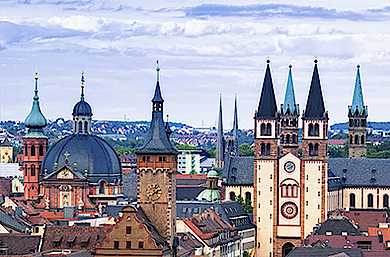 Accounting for almost 60 percent of the population, Christianity is the largest faith community in Germany. In the west and the east, Catholicism is prevalent, whereas Evangelicalism is dominant in the north. Protestants and Catholics are thus the two largest religious groups, followed by Muslims, Orthodox Christians, and Buddhists. Around 30 percent of Germans, principally in the east, belong to no religious group. Pork knuckle with dumplings, sausages with sauerkraut, as well as a fresh beer. These culinary export favourites are known around the world. But Germany doesn’t just offer a wealth of variety with meat dishes: Germany is the world champion when it comes to bread – offering over 3,000 different kinds. With grains, with light or dark flour, at breakfast or for supper, bread is served in many different forms. And there is of course bread’s indispensable companion: fresh butter and delicious cheese. This combination is used to make the Stulle (sandwich), which children and adults alike are always delighted to find in their packed lunch. At the breakfast table, milk plays a role that’s just as important as that of bread. Whether on its own or with muesli – high-quality milk is how many people opt to make a healthy start to their day. Want to know more about German quality?